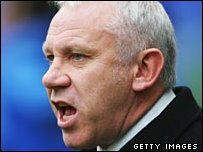 Former Manchester City and Sunderland boss Peter Reid has been confirmed as the Thailand national team manager. Reid has agreed a four-year contract, with a view to taking the nation to their first World Cup finals in 2014. The ex-England midfielder, 52, said: "It's a difficult job but I'm really excited about it. "It's a challenge but I know what it means to the people. Football and the World Cup is dear to their hearts and I want to take them there." Reid claimed he would soften his famously abrasive management style in his new role. "You have to be constructive, you need players with you, disciplined, with a good team atmosphere," he added. "You can't get people's backs up, different cultures react in different ways. I want to get the best out of these players and you can't do that shouting at anyone." Reid, who also managed Leeds and Coventry, added that he planned to immerse himself in Thai culture. "I come from Liverpool, a working class upbringing, I'm ready to get my fingers dirty and I'm not your typical beans-on-toast Brit," he stated. "I want us all together, me, the federation and the players. We all have to buy into this. We can't have a split camp, no-one can win anything like that." Reid follows in the footsteps of fellow Liverpudlian Peter Withe, who managed Thailand between 1998 and 2002.